A couple of weeks ago, with the van on a campsite, the threat of flood water in the van was getting higher. The kidlets had told each other scary stories, ranging from dying under tonnes of dirty water, to hearing screams coming from the direction of the river. 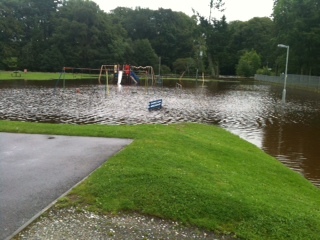 The water was very dangerous and the flood alert was in force for the area on the Monday. Local disabled residents were evacuated, and the caravan site was sitting smack bang in the middle of the flood plain. We took an early evening walk down to look at the raging river, and I couldn’t get close enough to get a good photograph of the river, and all roads in and out were closed. We sneaked across the football field, as close as we dared and although we could spot the raging river, we didn’t dare go close enough to get a decent one, so the flooded children’s playpark is the best that I could do. The raging water was terrifying. It certainly opens your eyes to just how awesome the force of water actually is, and I am someone who spent much time in the middle of the north sea on oil rigs in her youth. At night, we packed a couple of bags, and I had them sitting at the door of the van, just in case the river had a major flood. We were told that the “flood man” would let us all know if the river began to rise again. The rain seemed to thankfully be slightly easier that evening, and we hoped that the rain would stay lighter upriver so that it didn’t head down towards our precious van again. There were major floods here a few years ago, and lots of fears that it could be repeated. I had my alarm set for every two hours so that I could keep an eye on the flood alerts, and check out the window to see how it is going. I intended to pop out to the bottom of the site a couple of times during the night to see if they were under water. I never got that far. Thankfully we were at the highest up point on the site, so in less danger than the vans and tents further down the site. The kids thought it was an adventure, and we all slept in joggers so that we would be able to get out at short notice if the knock came at the door. I didn’t sleep well at all that night, and littlest woke up about 6 times during the night in terror. He sleepwalks, although it is not as often as it used to be. In strange places, he always has to sleep close to an adult so we hear him on the move. Several times, he ended up sitting bolt upright, in absolute terror shouting “mum, why aren’t you saving me?”? I guess I can get the gist of the nightmare. He faced the door of the caravan and it was not very nice to see hs terror & knowing he was still in his nightmare with eyes wide open. Thankfully, the danger passed, and with it the last of littlest night terrors.